We had to share this with you all as we think it is just so excellent! Our next door neighbours, the Baier family, have been so friendly and welcoming to us since we arrived in Crystal Shores Pt back in 2007. Along with the Vincent family on the other side of us, we couldn’t wish for better neighbours. We all chat away and help eachother out where we can but this past couple of days, we have discovered a remarkable secret about Ingrid Baier – she is a published author! Modest and unassuming, Ingrid has never thought to mention this to us before! We were gobsmacked! 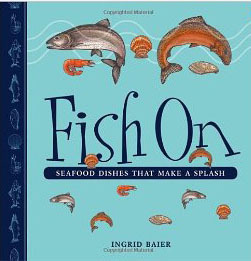 The book that Ingrid has recently had published is a down to earth cookbook that gives many great ways to enjoy fish. It is called “Fish On – Seafood Dishes that Make a Splash”. Ingrid has been kind enough to provide Jan and I with a copy with a little inscription and this is something that we will treasure. If you want to preview the book, you can do so via the Amazon site at the link above. Should anyone wish to buy a copy (and have it signed by Ingrid) to add to your own cookbook selection, order it from Amazon and when it arrives with you, drop me a line to let me know and we'll figure out a plan for getting Ingrid's signature on it. Jan has 3 on order (for her sisters and for her Mum and Dad, as a little Christmas present). This has been a strange year for meeting authors. We'll blog about another author living among us shortly.